The number of financial products currently available to portfolio managers is impressive, with some of today’s instruments offering enhanced liquidity and eased access to the underlying markets. 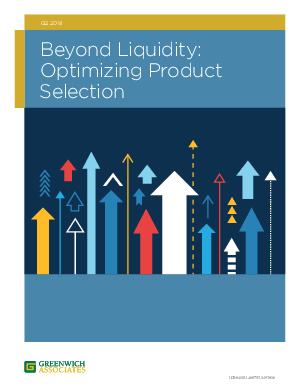 However, when it comes to selecting the best instrument for a given situation, a recent study revealed that portfolio managers and their trading desks primarily choose instruments based on past experience rather than through an analytical process. While the accumulated knowledge of an experienced portfolio manager should not be undervalued, a move toward more systematic instrument selection could ultimately enhance fund returns by capturing alpha invisible to the naked eye. By submitting this form you agree to share your contact information with BlackRock and to follow-up communication. Visit www.iShares.com to view a prospectus, which includes investment objectives, risks, fees, expenses and other information that you should read and consider carefully before investing. Investing involves risk, including possible loss of principal. This study was sponsored by BlackRock. BlackRock is not affiliated with Greenwich Associates, LLC, or any of their affiliates. iSHARES and BLACKROCK are registered trademarks of BlackRock, Inc., or its subsidiaries. All other marks are the property of their respective owners.